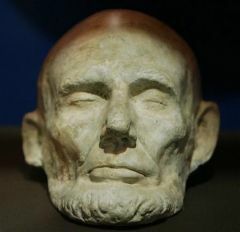 The left side of Lincoln`s face was much smaller than the right, an aberration called cranial facial microsomia. The defect joins a long list of ailments – including smallpox, heart illness and depression – that modern doctors have diagnosed in Lincoln. Laser scans of two life masks, made from plaster casts of Lincoln`s face, reveal the 16th president`s unusual degree of facial asymmetry. The scanning technique is usually used to create 3-D images of children with cleft lip and palate before and after surgery. Dr. Ronald Fishman, who led the study published in the August issue of the Archives of Ophthalmology teamed up with Dr. Adriana Da Silveira, an Austin, Texas, orthodontist who specializes in children with facial defects, to scan a bronze and a plaster copy of two life masks, owned by the Chicago History Museum.